The BestMassage EC-06c offers the best of both worlds. It’s competitively priced, yet provides many of the sophisticated functions associated with more expensive massage chairs. With 6 massage techniques, 3 automatic programs, and added extras like calf massage and vibration massage for the back, it’s a really appealing mid-price option. If you EC-06c appeals to you, you might also want to check out its sister chair the BestMassage EC-03. Below are some of the EC-06c’s stand out features. It’s definitely not a comprehensive list but it will give you an idea of what this chair has to offer. The BestMassage EC-06c recreates the 6 main techniques used by professional masseurs to relax and ease out aching muscles. These include: kneading, flapping, compression, rolling, tapping and percussion. The chop-action tapping is particularly effective for those who want a more vigorous massage, and can really soothe knotted muscles. There are 3 pre-set programs on the BestMassage EC-06c; Recovery, Relax and Refresh. Refresh is a fairly intense, vigorous program, and ideally suited for morning use, whereas Relax, as the name suggests, is better suited for use in the evening, and may even help calm those who have trouble sleeping. The Recovery program is designed to soothe and ease out muscular pain, which is ideal after exercise or a hard day at work. One of the BestMassage EC-06c’s finest features is the heat intelligent roller system. Heated rollers operate within the chair to produce therapeutic warmth across the body, including the foot rest. This is a particularly welcome addition for people who suffer from aching feet. The BestMassage EC-06c has a really impressive array of airbags considering its price. The 30 airbags are positioned strategically across the chair and offer a squeezing pressure, which is particularly effective around the calf muscles and feet. The neck massage feature, which is installed within the head rest, offers applied pressure to the neck and shoulder muscles, helping to ease out knots and relieve tension. Considering that this is an area where people often tend to experience pain, this is a distinct selling point. Is anything missing from the BestMassage EC-06c? The BestMassage EC-06c has many excellent features, which is quite unusual given that it’s a fairly low-priced massage chair. However, there are a few things that the chair is lacking. Being a cheaper chair, it doesn’t feature zero gravity positioning, which enhances the massage experience considerably. The Inada Sogno Dreamwave is a great example of zero gravity in action, though of course, it is priced to reflect its superior design. Some buyers have been frustrated with the seller’s customer support. The EC-06c isn’t made by one particular branded company, it’s a chair that is manufactured and then shipped to different sellers who can put their own brand on it. So while some seller’s will give you excellent support, some might not. That being said, the cheaper price might be worth the risk of getting poor support from the seller. It’s also a bulky chair, and unlikely to appeal to those who wish to move it around regularly. At a similar price, the iJoy-2580 is close to 150lb lighter, though it doesn’t boast the range of features that the BestMassage EC-06c has to offer. A few people comment that the arm and calf rests are slightly uncomfortable for wider limbs, though one user highlights the fact that the airbags can be switched off in the arm and leg sections, thus preventing any discomfort. One person also adds that they can tell the difference between the quality of massage that the BestMassage EC-06c offers and that of a more expensive model, but for the most part, the vast majority of users are really happy with the results. The BestMassage EC-06c comes with a 1 year limited warranty, which covers against any defects for all parts of the chair. A warning though, customers have complained about not getting adequate support from the seller so you may or may not have difficulty with getting the warranty honored. You have to weigh the risk of poor support with the much cheaper price to decide which is more important for you. This massage chair is an excellent all-rounder, which offers a sturdy massage experience without the hefty retail price. As a result, it’s likely to be an appealing option for people looking to enjoy an extended range of features, but who don’t want to invest thousands on a more expensive chair. The neck massage function is inevitably going to appeal to those who experience a lot of tension in their shoulders, particularly those who spend a lot of time at a computer or sitting at a desk. Likewise, the heated foot support and calf massage is going to be a welcome feature for people who stand or walk a lot, as it offers a lot of relaxation and relief in these areas. However, the BestMassage EC 06c is bulky, so it’s more suited for someone who has the space in their house to place the massage chair on a permanent basis. Whilst this chair comes with many great features, it’s important to note that it doesn’t offer the same high quality of massage as some of the more expensively priced models. As a result, those who are seeking a more intense, ‘human touch’ massage experience, would do better to invest money in a more sophisticated state-of-the-art chair. Whilst it does have limited arm massage functionality, it’s important to note that this chair doesn’t really offer a complete body massage, so again, those looking to achieve this may want to look elsewhere. However, for the cost, it certainly offers a considerable amount of features. 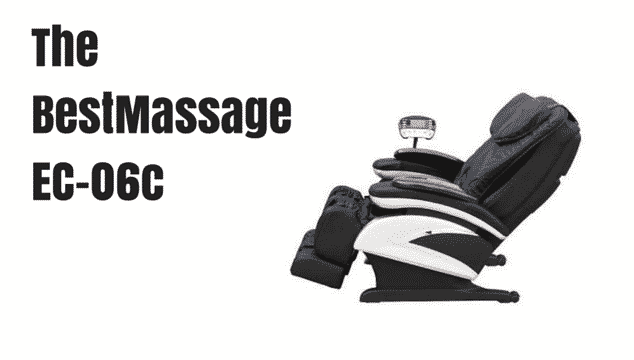 There’s little doubt that the BestMassage EC-06c is a highly attractive option. It boasts a number of sophisticated features, such as heat therapy, 30 airbags and customizable massage functionality, which make it appealing to those who are serious about massage. The different styles of massage, including kneading, rolling and compression, are all really effective in easing and soothing muscular aching. However, whilst it offers an incredible amount of features for a reasonable price, it’s important to be aware that in terms of high quality massage, it can’t quite compete with more expensive models, such as the Osaki OS-4000 and the Fujimi EP8800. However, given that it’s a fraction of the price, this may be a compromise that you’re willing to make. In addition, with some customers complaining about spotty customer support, if the chair does have problems you might have a difficult time dealing with customer service. Most buyers have been happy, but some have had issues. You’ll need to decide if the incredibly low price is worth the possibility of getting poor service. In essence, it’s a good all-round performer, offering a pleasant massage which can be tailored to your specific requirements. When you invest in a BestMassage EC-06c, you’re certainly getting a lot of technology for your money.